I have been so focused on soups and pumpkin lately. In my defense, ummm helloooooo 'tis the season. Please, someone tell Kevin that! Just wait until cookie season starts Oy! Kevin will have a kitten. Well actually he will have a fistful of cookies, but he has kinda gotten used to have sweet treats around the house (all pumpkin favored mind you) so the complaining might be minimal. That is until he finds out that I have been baking all day so dinner will consist of sandwiches, and possibly reheated soup. Perfect for me, not so much for him. Now when I want to make him happy I break out the pork. He would of course prefer beef, but have you seen how expensive it is lately? Sheesh! You need to take out a small loan just to buy a few pounds of ground beef for goodness sake!! It is crazy town I tell ya. Chicken and pork are much more budget friendly. Although I could eat chicken just about every day of the week, minus a few nights of stuffing my face with baked goodies...did I say that out loud, would my darling Kevin agree with the idea? Oh noooo, He has taken up where my father left off. My Dad used to tell me after a few days, or weeks, of chicken dishes that he was going to sprout feathers and lay an egg. Gotcha Dad, dramatic much? Seriously though, I loved that banter between us, it was all in good fun. I would give anything for another day of it with him. So on this night, pork it was. He really likes a good ol' fashioned fried bone-in pork chop. Ya ummm not so figure friendly and, with all of the pasta and pumpkin treats I have been scarfing down, I was not about to add to those calories with fried food. Baking was the way to go for me. Plus I am all about a good one-pot/pan meal to make clean up quick and easy. OK, now what to do with the pork chops? I have come up with quite a few recipes over the last couple of years. There has been Maple Bourbon Pork Chops and Whipped Potatoes with Apples and Onions, Pork Chops with Mushrooms, Shallots, and White Wine Gravy, Pork Chops with Potatoes and Apples, Hoisin Grilled Pork Chops, and Grilled Pork Chops with Peach, Bourbon, Mustard Sauce. Are ya feelin' the porky love flowin' here yet folks? These are just a few. But in the end I decided on a new recipe to tantalize our taste buds, and it delivered. Sweet, tangy, with the herby rosemary in the background. Soooo tasty. Kevin ate two chops, plus half of mine, and took the left over one to work for dinner. I guess it is safe to say he liked them right? Yay! Now I can go back to my pumpkin addiction!! What is your favorite way to prepare pork chops? Heat 2 tablespoons of olive oil in a large cast iron skillet, over medium-high heat. In a small bowl, combine the whole grain mustard, 1 tablespoon of olive oil, salt, and pepper. Pat pork chops dry with a paper towel. Coat both side of the pork chops with the mustard mixture. In another small bowl, stir together the dijon mustard, honey, olive oil, soy sauce, garlic, and rosemary. Set aside. Sear the pork chops for 2 to 3 minutes. Turn over and pour the honey mustard mixture over the top of each pork chop. Place skillet in the oven and bake for 20 to 25 minutes. Spoon any sauce that remains in the skillet over the top of the pork chops. I do not do enough with pork chops and pork tenderloin. I've been planning what to make for the blog over the next two months, and I very much want to correct the whole haven't-had-pork-in-freakin-forever thing. Okay, how funny - my dad is the same as yours on the chicken issue. And for him it was turkey too. He would even complain about having to eat turkey at Thanksgiving! His objection to eating so much chicken was that live chickens "walk around in their own sh!t"! I don't know.... And that gene seems to have skipped my generation, I love chicken and turkey! 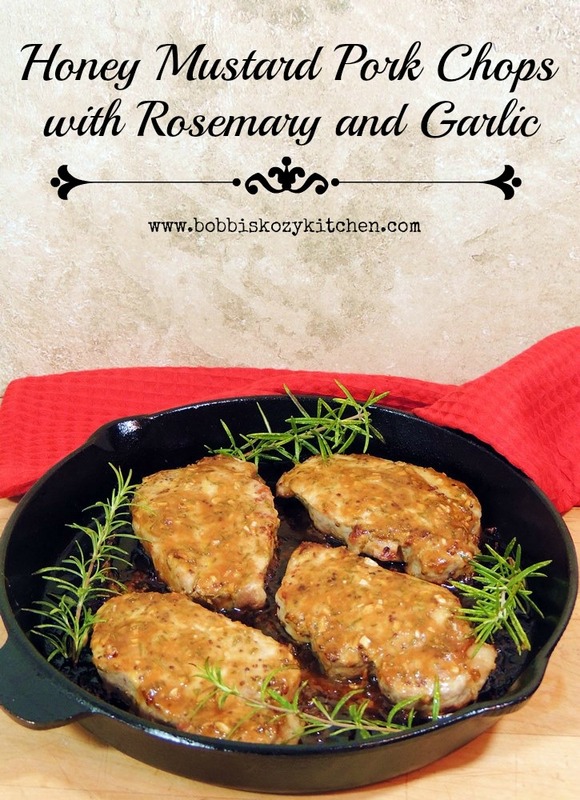 Your pork chops look so beautiful, I love that you used your cast iron! So glad you like the chops and I adore my cast iron!! I need a bigger one, this is a 10" skillet. are these bone in or boneless? These are boneless, but you can use bone in if you prefer.